There are always teething problems on opening night. AS BEAU Ryan said: "I'm on all the promos." But even that didn't save the former NRL star turned TV funnyman in the season opening episode of the Channel Nine Footy Show. The network's flagship rugby league program has a different look this year. Host of 23 years Paul "Fatty" Vautin is gone and in his place is presenter Erin Molan. Molan has been part of the show for several years but is taking on added responsibility in 2018. A much more minimalistic set was another noticeable change in Thursday night's show that followed the Dragons' comfortable 34-12 win over the Broncos. While there were always likely to be teething problems, Channel Nine probably wasn't expecting one of them to be as cringe-worthy as the oversight that put Ryan in the spotlight before he'd had a chance to crack his first joke. 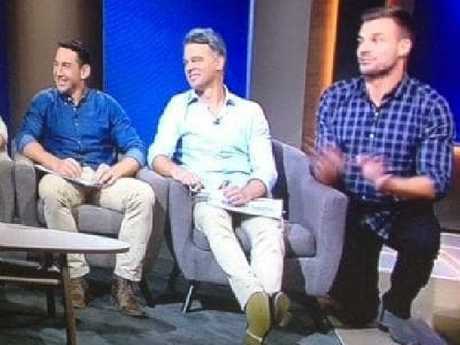 Walking onto the set to join rugby league Immortal Andrew Johns, Penrith winger Josh Mansour, Melbourne fullback Billy Slater and former NSW star Ryan Girdler, Ryan got to the end of the line when he realised something was amiss. There was nowhere for him to sit. Gone was the desk that every member used to sit behind - this season guests are given individual armchairs to plonk themselves in. Well, all guests except Ryan. Molan: There doesn't appear to be a chair, Beau. Ryan: Can someone get me a chair, or ... what's going on? Molan: Yeah that's a little bit awkward. Ryan: Am I actually meant to be on the show? Molan: Yeah you are, you are, you're very welcome. How have you been anyway? It's been a long off season. Ryan: What's going on with the chair? Can I seriously get a chair? I'm on all the promos. Not wanting to stand above his colleagues and look down on them, Ryan kindly knelt down to their level. It was hardly the way Channel 9 would have wanted to launch its new-look show, but all the panellists took it in good humour. Ryan was the awkward fifth wheel. Some of those watching weren't overly impressed with the new-look show, criticising it for being too vanilla and saying they won't be tuning in again. The bells and whistles are gone and it was a much more sedate production. Angry fans also took to the program's Facebook page to express their disappointment. "I've been watching this show since 1996 this is by far the most boring worst episode in nrl footy show's 25 years of history," one person commented. "Who needs sleeping pills when you've got the new Footy Show," wrote another. "Absolute yawn-fest. Couldn't even give Beau a chair. I've watched footy show every week for over 10 years, it's completely ruined now - I won't be watching again," another person said. Viewers can expect plenty of changes to this year to streamline The Footy Show and make it more attractive for the later 9.45pm timeslot. With 23 live NRL matches on Thursday night in 2018, the show has slashed costs to move the show in-line with it's later timeslot. "People will notice a change to it," Channel 9 director of sport Tom Malone said. "Andy O'Brien the EP (executive producer) has done a terrific job. Gary Burns (network consultant) has as well. Their brief has been make rugby league cool again. Make The Footy Show cool again. "It's a success already. From a business point of view we've remade it to a more appropriate show to follow Thursday night football. There's more post-match analysis. It's a cheaper show to produce. It makes more sense for the business. "That was one of the main driving forces behind why we had to make a change. Two years ago we only had six nights of Thursday night. Now we have 23. There is no longer the need for an all-singing, all-dancing stand-alone Thursday night footy show. So we've remade it into what we believe is a better version at a better cost. We already think it's success and we think viewers are going to like it as well. "The targets are going to be different because it's no longer going to be on at 8.30pm on a Thursday night. It's not expected to draw the same audience that it would have at 8.30." Nine is yet to begin looking for potential replacements for Molan when she decides to take maternity leave this year.